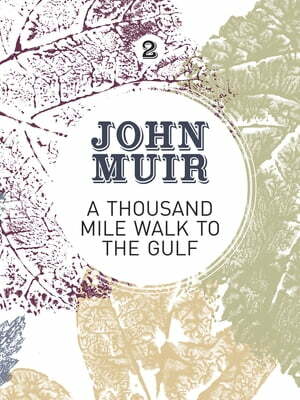 Collins Booksellers - A Thousand-Mile Walk to the Gulf by John Muir, 9781911342137. Buy this book online. Muir’s walk from Indiana to Florida was conceived in order to explore and study further the flora and fauna across states. He undertakes this alone, a dangerous choice perhaps so soon after the civil war, as many characters along the way forewarn. Indeed, Muir is threatened by a robber, and we see a new side to the quiet, lowly gentleman we know as he springs into self-defence mode with lightning initiative and remarkable courage. This is not the only facet of Muir’s personality that is uncovered throughout this journey. He makes reference to feeling ‘dreadfully lonesome and poor’, which is intriguing as his circumstances are self-sought: ‘Stayed with lots of different people but preferred sleeping outside alone where possible’. He spends a substantial period of time struck down with malaria, which does not come as a surprise; he was covering many miles on an unsustainably meagre diet with thirst often quenched with swamp water or not at all. Join Muir in Kentucky forests, Cumberland mountains, Florida swamps and all the elegantly described trees, plants, creatures and rocks in-between. A Thousand-Mile Walk to the Gulf teaches us as much about Muir himself as it does the ecosystems in the wilderness across those 1,000 miles.